Introducing a new member to the family always requires adjustments. Mishka, being young, adjusted easily to the new environment and schedules, but he has not been really introduced to our two cats. He has seen both cats from a distance, but we are allowing the cats to take their time to get acquainted in their own ways. Sharii has been the bolder one, mostly because he has the stronger claim on the home territory and stays closer to home most of the time. He was a kitten being introduced to our Hanah about six years ago. He warmed up to her quickly. He always rubbed up against Hanah purring loudly and Hanah used to try to back away because eventually he would begin wrapping around her legs and biting her. Sharii loves just about everything that does not make loud or strange noises. That same Sharii has sat on the back deck watching Mishka through the glass door without any threat. He even was within a foot in the back yard with a fence between them. However, Mishka is a little too much puppy for Sharii to try his direct affections on him yet. Now Midnight is quite different in her approach. For one, Midnight is not a dog lover, nor much of a cat lover either...she is a people lover, although I am her favorite human as far as I know. While Hanah was trying to get away from Sharii, she also just loved Midnight, but Midnight did not love her. Midnight would run away from Hanah and Hanah would chase her within our perimeter. Pretty much, Sharii would do the same, so Midnight often leaves the property to go to other places around the neighborhood or in the woods for much of the day. Being the smallest cat in the neighborhood has its disadvantages, but one thing she is very good at is finding places to hide and she is a very friendly to everyone. I often see her approach someone, plop down, and roll around in front of them...who cannot resist petting her or even picking her up? Most people think she a half-grown kitten but she is five years old. So, Midnight was not even in the mindset to want to warm up to a new exuberant hunk of fluff that likes to chase and out weights her by more than double with paws about half the size of her head, but when she saw me picking up the puppy...me, her protector from dogs and Sharii, me, who makes sure I spend at least 20 minutes almost every day giving her quality time and primming her. Well, her look said it all. Midnight has stayed away overnight before, but not often. Unless she has food from a hunt, she usually comes home for dinner and when she is not here, we ring a bell. We have done this since the cats were kittens. We rang a bell when they were eating so that they would associate the bell to meals, knowing they were to be outside cats. I can ring it at anytime of the day and because it can be heard all over. They both usually show up within in few minutes even if they are not that nearby. We came home on Tuesday from our errands and Midnight did not show up even to the bell. I was a little more concerned than usual because of the new puppy factor, but puppies need lots of attention so I was distracted most of the following days. I had not seen Midnight and my daughter failed to mention that she had not come to dinner the next day either, but I knew because even though Sharii is rough with her and does not mind her being out and about during the day, he sorely misses her when she does not come for dinner and he is all alone in the garage for the night. Sometimes he will not eat if she is not there...well, he will not eat right away. We heard his mournful howling for hours. 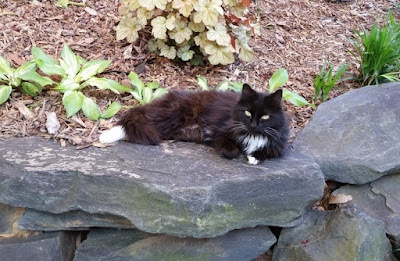 Thursday evening after ringing the bell and not seeing my Midnight, I began knocking on a few neighbors' doors showing a picture of Midnight on my smart phone. Yeah, that cat gets around but most said like us they had not seen her for two days. I have always had this concern about Midnight that someone would take her or at least take her inside their house so she could not get out. Midnight loves going inside houses, but also hates being forced to stay in. I often let her in on hot or cold days to take a nap on my lap or a chair. She paws at the glass door in the back when she wants to come in. I went out the next morning calling her and meeting some of the parents at the bus stops. Still no Midnight. I was planning to go a different direction to knock on doors that evening, but a neighbor I had talked to stopped by and showed me a picture of Midnight saying his daughter was friends with a girl whose family had found the cat, although they would not be home for a couple more hours. After dinner I went to get my cat. The father of four young children answered the door and I showed him the picture, He said he figured she belonged to someone and he was just holding her until they could locate the owner. I thought this family might be new to the neighborhood as we now have quite a few rentals here, but no, they have lived here for six years. He said Midnight just walked right up to him and was very friendly. I told the children that if Midnight comes around again that they can pet her but I asked that they do not take her inside the house because she cannot come home and that she has a "brother" that missed her so badly that he has been crying for her for the past two days. They said good-bye and I asked if they would like the collars back because I do not put collars on outside cats that hunt and can get them caught, but the father said no. I carried Midnight home, who seemed happy to let me, but she was not herself...she was not purring as she usually does when being carried by me. One of the collars was a flea collar, which makes me ill and they do not stop fleas anyway. I think Midnight hated it too and it was making her sick as well. I took off both and began combing her out. Fleas are always a problem for the cats, but they are a bit happier after I comb them out. Midnight seemed to just be tolerating the combing instead of fully relaxing. After her dinner and a night with Sharii, everything was back to normal the next day. Midnight even tried to approach me when I took Mishka out...she came within 18 inches of him. I picked her up, showing her again that I will not let the puppy pester her. Her willingness to approach me while with him proved to me that she was not staying away just because of Mishka. She was content up on her regular perch on my left shoulder...but she has not yet purred once for me since her return. There is so much going on in our lives right now, but as I prayed about Midnight, God was telling me that she would be coming back...vague on the how and when, though. So I was not highly worried, I just wanted to get her back where she belongs. Midnight was out and about yesterday to come around at dinner time. I gave her lots of attention and combing out yesterday as she fully relaxed in the early evening, but still no purring. She is out napping in some cool spot right now, I would think, enjoying her freedom once again. Thank you, my Lord, for all my pets, and for protecting and bringing Midnight back to me. Of all the pets I have ever owned, I have always felt she needs my protection the most.